Finding the right key lock box for your home or rental unit is critical to the safety of the people living in or using your home. The best lock box for keys is also very important for businesses ensuring that their assets are protected from theft and vandalism. 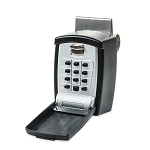 The AccessPoint Key Safes made by Kidde are the standard for key lock boxes. They are built tough with a body that is cast from a zinc alloy rather than welded steel. Ne'er-do-wells can attack the key boxes with sledge hammers and still not gain access. The Kidde Key Safes do have one potential drawback. If you lose the combination, there is no way to open the lock box other than by destroying it. There is no magic 'factory override' combination. for both the renters and the owner. lets you keep your keys where and access them when you need them.